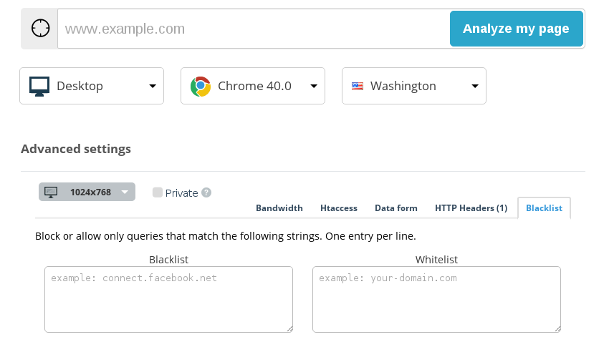 Today, new features are available on dareboost.com: the blacklist and whitelist, that will allow you to measure the performance of your web pages when blocking specific resources. Let’s discover together some use cases. That’ll also be a perfect opportunity to introduce the multiple advanced parameters available to all our customers. The blacklist allows you to block requests containing a specific string. For example, to block the Facebook widgets, enter: connect.facebook.net. On the other side, the whitelist is used to define the allowed resources (all are blocked by default). For instance, to test dareboost.com excluding all third parties, simply enter dareboost.com in the whitelist. The blacklist and whitelist fields can each contain several values (one per line). For advanced needs, these fields also accept regular expressions. Testing/beta phases are often available online, but protected by basic authentication, generally using a .htaccess. Because it is important to test your web pages performance as soon as possible, our service allows you to check these pages: just enter the username and password needed. You’ll get the same results as on any other page. Note that you can also use authentication (and all our advanced settings) for your daily monitoring. So you can benefit from our email alerts and weekly recaps for all your pages, including those under development! Our service is also able to check pages only accessible by sending a form (POST data). It is very useful for example to test the search result page of an e-commerce website. To use this feature, be sure to enter the form’s destination page in the URL field, and then fill in the form fields the correct input names and wanted values. To go further, it is possible to configure custom HTTP headers. For instance, you can update the default User-Agent, add cookies, enable debug mode on your CDN, etc. Dareboost uses mainstream web browsers (Real Browser Testing / Monitoring). We simulate a visitor on your web page as precisely as possible: thus, you can choose the bandwidth and the screen resolution. The bandwidth and latency will impact all your performance metrics. Do not forget your users with a low Internet connection: also test your web pages with reduced bandwidths. The screen resolution impacts on the performance indicators related to the display, discussed in a previous article. Consider your website statistics to check the performance on the most appropriate resolution. If you already have a pro offer, do not wait anymore: use the advanced settings now from our web performance diagnostic tool or our comparison feature. If you only have a free account, I’m sure that we provide an offer that fits your needs!